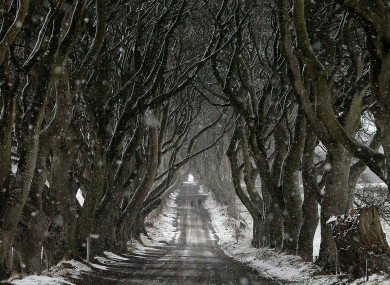 THE POLICE SERVICE of Northern Ireland (PSNI) has launched an investigation after road signs near the Dark Hedges, a location made famous by hit TV show Game of Thrones, were vandalised. The tunnel of beech trees – known as the Dark Hedges – is located on the Bregagh Road, near Armoy, Co Antrim. It was featured in the opening episode of the second series, when young heroine Arya Stark escaped the city of King’s Landing disguised as a boy. The PSNI said that police on patrol in the Bregagh area of Armoy today noted that paint had been sprayed on a number of road signs. No arrests have been made in relation to the incident, according to the PSNI. Last October, Stormont’s Department for Infrastructure ordered a ban on cars on the Dark Hedges road to protect the trees from damage due to the high volume of traffic that has passed through it in recent years. Anyone who witnessed the damage being caused or anyone with information about the incident is asked to contact the PSNI on 101. Email “PSNI launches investigation into vandalism of iconic Game of Thrones location in Antrim”. Feedback on “PSNI launches investigation into vandalism of iconic Game of Thrones location in Antrim”.